It fell to the bottom of my makeup bag and lay forgotten. Months later, after I read at least a dozen more glowing reviews, I decided to unearth it. After a hurried experimental application, I jetted to the city for dinner. In the twinkling lights of the restaurant I caught a glimpse of my reflection, and my mind was changed forever. 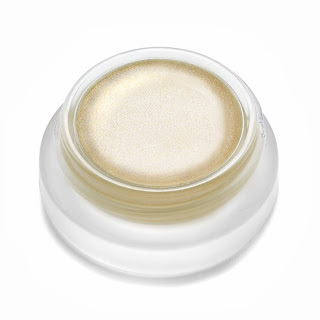 You see, this luminizer isn't filled with glitter, shimmer or shine. That's just too easy for RMS. It's subtle. In certain lighting, you won't notice a difference in your skin (i.e. my harsh fluorescent overhead bathroom lights). But in other environments, it makes your skin look lit from within. It has infinite uses. Try it as a highlighter for your brow bone. Use it to accent your cupids bow. After applying lipstick, dab it onto the center of your lips for added dimension. Attain cheekbones like Angelina Jolie with a few swipes. Some unconventional uses include the collarbone (for those strapless evening dresses), alone as an eye shadow, and as a lip gloss. The little pot contains coconut oil and mica to accomplish that luminous effect. The application is creamy, with a satin-pearl finish. But remember when applying that a little goes a very long way. And bonus, because it contains no colors or dyes, it can be used on all skin tones. Have you tried this cult classic? Where do you apply it? Ricinus communis (castor) seed oil*, cocos nucifera (coconut) oil*, cera alba (beeswax)*, tocopherol (non-gmo), rosmarinus officinalis (rosemary) extract*. may contain + / - : titanium dioxide ci77891, mica ci 77019. *Certified organic. I sought out this product, received a free sample courtesy of RMS, and was not compensated monetarily or otherwise for this post.